Jeremy Lin wasn’t selected in the 2010 NBA Draft, but some nice play in the Summer League with the Dallas Mavericks. He averaged 9.8 points and 3.2 rebounds in 18.6 minutes in five outings with the Mavericks, shooting a team-leading 54.5% from the floor. (See Jeremy Lin’s Summer League Highlights.) With stats like that the Jeremy Lin sweepstakes were on. Top contenders included the Dallas Mavericks, LA Lakers, and Golden State Warriors. 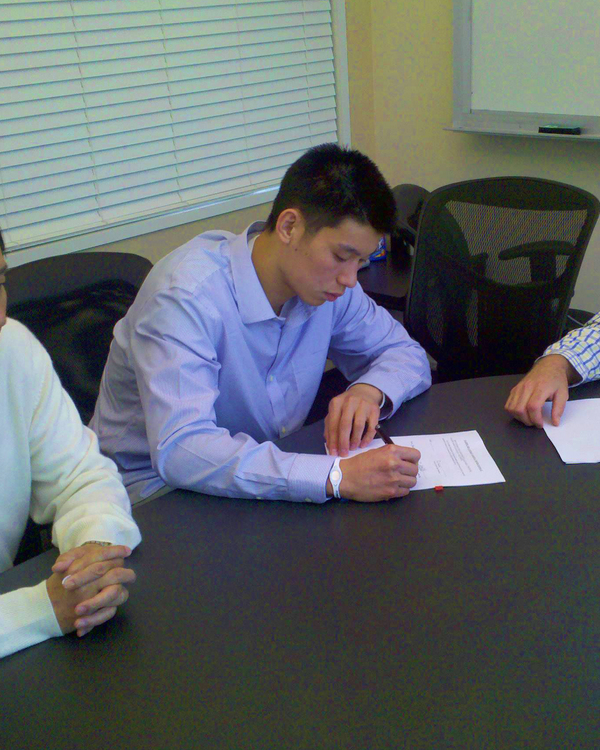 Today, the Warriors have signed free agent guard Jeremy Lin to a contract. Terms weren’t disclosed, but rumored to be a first-year salary of nearly $500,000 (3/4 guaranteed) and potential 2 year deal. Good move by the new Warriors team owners. Asian American fans will be coming out in droves to Warriors games. If you thought Yao Ming was big, you haven’t seen anything til you see Jeremy Lin play for his home team. Look out SF Bay Area. Jeremy Lin could be popping up on at a billboard near you. Get your Warriors Season Tickets now. This entry was posted in sports on July 21, 2010 by Kevin Hsieh - channel APA. I wouldn’t be quick to call Jeremy Lin “Chinese”-American though, considering the fact that his parents are from Taiwan. Just saying…. His parents said they are from taiwan, but they are Chinese descent. “taiwanese” is NOT an ethnicity. Jeremy Lin also said he’s an American from CHINESE DESCENT. Get that straight, buddy! I suggest you educate yourself buddy. Not everyone agrees that Taiwanese and Chinese are the same thing. Matter of fact, Channel APA has covered a good number of Taiwanese people already. Jeremy Lin actually refers to himself mainly as an Asian-American, he also said he thinks of himself as a basketball player first! So you get that straight buddy!